Already a firm favourite amongst James' fans and gracing the dishes of many a TV chef, these tiny watermelons lookalikes have a refreshing flavour and bags of personality. Plus, their lush vines will produce masses of fruit throughout the summer with a ‘cucumber and lime’ taste, Ready when they are grape-sized and still firm to the touch. Try in salads, pickled whole, or why not explore their cocktail-enhancing prowess? Easy to grow. Vigorous climber/trailer. Pest and drought resistant. Origin: Mexico. Latin name: Melothria scabra. 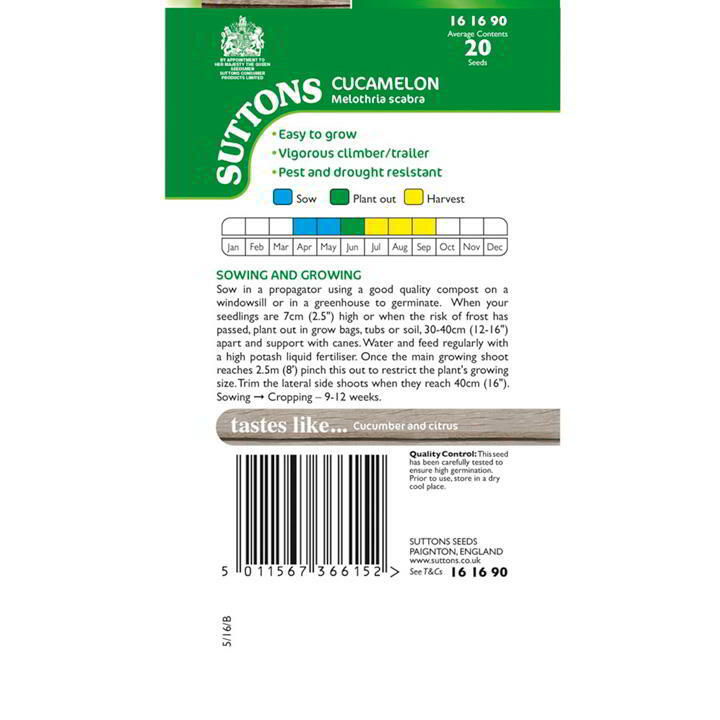 These tiny watermelon look-a-likes from Central America are small enough to fit into a teaspoon, yet bite into one and the flavour is pure cucumber with a fresh tinge of lime. Popular since pre-Columbian times, these rampant trailing vines produce a constant stream of fruit throughout the summer, known in Mexico as ‘Sandíitas de Raton’, literally “Little Mouse Watermelons”. Despite their exotic origins and adorable appearance, they are much easier to grow than regular cucumbers. They are ignored by pests, resistant to drought & perfectly happy to grow outdoors in the UK, given a sheltered sunny site. Tastes like: Cucumber and lime. Cucamelons can also be treated like a perennial providing you with fruit year-after-year. In late autumn once the fruiting period is over, lift the cucamelon's main radish like root and store in barely moist compost in a garage or shed over winter. Plant out again in early April to achieve early fruiting. Sow: April-May. Harvest: July-September. Sow in a propagator using a good quality compost on a windowsill or in a greenhouse to germinate. When your seedlings are 7cm (2.5") high or when the risk of frost has passed, plant out in grow bags, tubs or soil, 30-40cm (12-16") apart and support with canes. Water and feed regularly with a high potash liquid fertiliser. Once the main growing shoot reaches 2.5m (8') pinch this out to restrict the plant's growing size. Trim the lateral side shoots when they reach 40cm (16"). Sowing ➞ Cropping – 9-12 weeks. 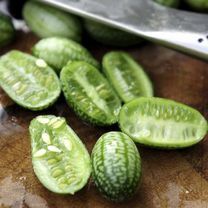 EATING: Cucamelons can be eaten in exactly the same way as traditional cucumbers - sliced into salads, chopped into salsas or pickled whole like cornichons. 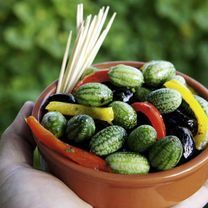 Mix whole cucamelons (fresh, blanched or pickled) into a bowl of olives and serve with drinks, or why not go the whole way and spear them with toothpicks and pop them in a martini. RECIPE: Pickled cucamelons with dill & mint - A brilliant way to make these crisp summer fruits last well into the depths of winter; home pickling is far easier than you would ever think. • 375ml white vinegar (such as distilled malt or white wine) • 1 tsp salt • 4 tbsp sugar • 1 tbsp dill, chopped • 1 tbsp mint, chopped • 1 tsp coriander seeds • 250g cucamelons •1 fresh grape leaf or oak leaf METHOD: Pour the vinegar into a bowl and add the salt and sugar. Whisk until the salt and sugar have completely dissolved. Stir in the dill, mint and peppercorns. Wash the cucamelons in water and pour them into a sterilised jar (sterilise jars by simply running the open jar through the dishwasher on the hottest cycle). Scrunch up the grape (or oak) leaf and pop this on top of the cucamelons. The tannins in this will slowly disperse out and help keep the fruit crisp. Pour the seasoned vinegar into the jar and seal tightly. Refrigerate for 2 weeks at which point they will be ready to eat. At Suttons we take food sensitivity seriously. If you are unsure you may be allergic to any varieties in the James Wong Homegrown Revolution range, please take the precaution of seeking medical advice. I grew these for the first time last year, both in the greenhouse and outside in a pot. Both produced an abundance of little shrunken watermelons - great in salads and pickled with dill and finely sliced onions. They do need a trellis or, as in the case of my greenhouse, a network of string to climb up and along.